The seaside spa of Wyk auf Föhr is celebrating its 200th anniversary and we are celebrating with it! As Denmark’s oldest seaside spa as well as the oldest on Schleswig-Holstein’s western coast, it has always played an exceptional role and invited guests from near and far – including elite public figures and celebrities – to take the waters and relax there. The Danish kings who established their summer residence here enjoyed the amenities of the seaside spa, which also included social life and quality entertainment – and the same is true of Prussian princes. Inspired by the island, writers and poets like Hans Christian Andersen, Theodor Storm and Theodor Fontane worked here. The waltz king Johann Strauss spent his honeymoon on Föhr and composed a waltz. 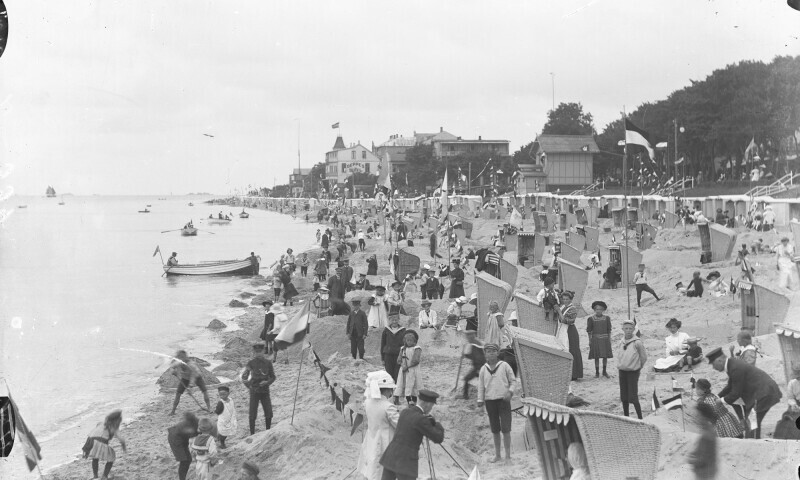 Although they are intimately linked with the history of the seaside spa, many of the exhibited objects are being shown on Föhr for the first time: these include the early Impressionist plein-air study “Das Seebad” (Seaside spa) by the Swiss painter Albert von Keller, the watercolour of Crown Princess Victoria of Prussia or the delicate studies of Wyk’s bathing beach by the Dresden Impressionist Paul Wilhelm. Artworks created for the renowned North Sea sanatorium of Dr Gmelin on Föhr’s south beach are also of great significance. In addition to furnishings designed by the famous Jugendstil architect August Endell, the exhibited pieces created by the most important protagonists of reform art from around 1900 reveal the extent of the sanatorium’s intellectual and artistic influence through its illustrious crowd of guests. These included Wenzel Hablik, Johann Vincenz Cissarz and Ada and Emil Nolde. When the beach was conquered around 1900 as a new sphere for tourism, its trappings also became transformed: beach tents, hooded beach chairs and sand castles invited guests to linger there. Bathing suits and bikinis offer a “revealing look” at changing attitudes towards “decency and morality”. For a long time, using postcards to extend greetings to those back at home remained obligatory for every traveller.